NILLUMBIK Councillor, Jane Ashton lost her twin sister exactly 15 years ago. Julie was murdered by her estranged husband. Her sister’s death is part of a sickening statistic where one woman per week is killed by a partner or former partner every week. “We must change this,” Cr Ashton told a Council meeting recently. Nillumbik Council listened and is taking a stand to promote gender equality and prevent violence against women and children, unanimously adopting a Gender Equity Policy. Cr Ashton told the Diary she believes there is a link between gender equity and family violence. “Equity is that everyone feels safe — and that physical attributes, your size, your strength, your gender, shouldn’t determine how vulnerable you potentially can be. She says it is also about having respect. “I think that if you are in a safe workplace, learning about equality and learning about the importance of language and learning and modelling respect, and respectful relationships — you are more likely to take that home and be able to influence your family and friends,” she said. “Particularly with men, it is about giving them the tools and confidence that they can intervene or step in or say something. Cr Ashton knows only too well the devastation that family violence can lead to. “It is an absolute waste of a life — it is the worst form of murder — my sister had been murdered by someone who had been to my house, who had cuddled my babies, had Christmas dinner with us — what a betrayal”. She says that while most perpetrators of these attacks are male, men should understand that they are part of the solution. “The majority of men love and respect women, and they want their wives and daughters and sisters to be safe, but men also understand what other men can be like, and so it is very challenging when you are talking to men and they become very defensive. “But men have to understand it is a real issue — murder is the ultimate form of family violence, but there are heaps of levels that go on underneath that. “I’ve spoken to women in hospital who are severely damaged, and that is quite a regular occurrence,” she said. Cr Ashton said police attended family violence incidents in Nillumbik every day, with sexual violence reported weekly, “we must change this”. She told Council it was worrying that one in three people in Nillumbik did not believe in equal relationships between men and women. “We must change this,” she reiterated. “We all know someone who has been affected by domestic violence in the community. During an interview with the Diary, Cr Ashton said” “we can’t just rely on the police to arrest people or lock people away, or the courts to issue intervention orders, they have to try and manage attitudes around violence, and the way we do that is by promoting gender equity, challenging stereotypes and really supporting women to achieve equal outcomes”. “Things don’t just happen on their own, they don’t just change, you really have to look at everything: from your advertising, when you are interviewing how flexible you can be, because it is alright saying you have equal opportunity, but people aren’t coming off an equal base, women often have breaks to have children, they don’t have a linear career path so we have to be a lot more flexible,” she said. She said there is still a glass ceiling discouraging women from moving into leadership roles. “From our politicians, to lack of female CEOs, for some reason there are barriers there to women being in those positions. “You have to get it into people who are white Anglo-Saxon male: you come with privilege you don’t even know that you have, if you have never been someone who is marginalised or disenfranchised,” she said. It is not just women who benefit from gender equity, she says there are benefits for everyone from moving away from stereotypes. “It should take the pressure off about being an alpha male, for men to being able to enjoy their children and being able to enjoy things that are seen as more subtle sensitive, emotive, without any embarrassment. “To reduce those stereotypes around both men and women frees us all and liberates us all and I definitely think that men have to be comfortable in their own skin too. “Men that are artistic and creative people should be able to be themselves, whatever their gender or sexual orientation, everyone can contribute to community and be happy,” Cr Ashton said. She said Nillumbik Council’s initiative in adopting a gender equity policy statement would be reflected in all its internal and external operations. “That is making sure internally we have got it right and externally with sporting clubs, sporting facilities that we have got it right — that can actually create gender equity for men too — if you build a swimming pool for example, now we are having central family friendly toilets and change rooms, so whether you are male or female you can be with your child and go into a changeroom or a toilet, and that child is safe and with their mother or father”. “We have to do the audit on ourselves, make sure we have got things in place. “We look through everything we do through a gendered lens — we look at everything — how we are building something, funding things,” she told the Diary. As part of 16 Days of Activism, Nillumbik Council are officially supporting both Victoria against Violence and the global campaign. This State campaign, now in its third year, involves 16 days of activism from November 25, which is the International Day for the Elimination of Violence against Women to December 10, International Human Rights Day. Activities in Nillumbik include a play reading, and Council are taking part in the Christmas Hills Mechanics poetry readings. 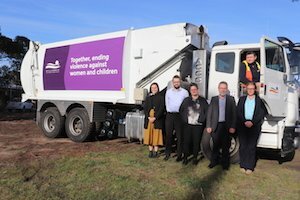 Council is putting the message on local garbage trucks to tell every family in Nillumbik that family violence has to stop. Council is also offering five small grants of $500 each to local groups and businesses to fund activities to raise awareness of violence against women and promote gender equality. “I really believe in lots of small grants to enable communities to explore ideas themselves, rather than always drive it or hold people’s hands,” said Cr Ashton. Applications for the grants close on September 21, 2018.